I am determined to get better at blogging and taking photographs so these are my current reads. Blogging is a challenge for me as I'm generally quite an introverted person and I quietly bumble along in my studio with only my dogs for company all day. I feel like each post brings me out of myself a little more though so I am determined to persevere and hopefully make blogging a more regular thing. 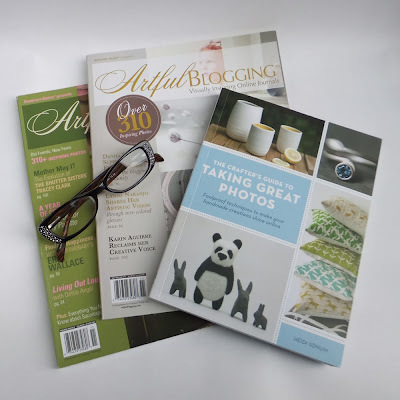 It doesn't help that I feel like such an amateur, but practice, reading gorgeous magazines like these and paying attention to what I love about the many different blogs that I read will hopefully help that feeling to lessen and help my blog improve. I over think things - it's silly! What are you trying to improve at the moment and what are you using to help you do it? That sounds intriguing! What's a tin foil light board??? It's a reflector board to point the light where you want it to go - it's very handy in our dark little cottage, you have to grab any scrap of light that's available!